Shelly Giordano founded the Funding Longevity Task Force and serves as Chair. Shelley has been a pioneer in reverse mortgage lending, having begun her career almost two decades ago. After years at home raising her children, she fell into the unlikely world of reverse mortgages. A local lawyer had established his own company, and having seen how adept she was at raising money for charities, thought she would be good with elderly people. From her very first client she was hooked. She, like other originators, witnessed palpable relief at reverse mortgage closings because the clients were able to improve their retirements without having to give up home. Shelley lives in Washington, DC and advocates there for financial literacy with Women in Housing and Finance. She mentors and coaches elite loan officers throughout the country who have participated in her comprehensive training program, and who have committed to strict ethical standards. 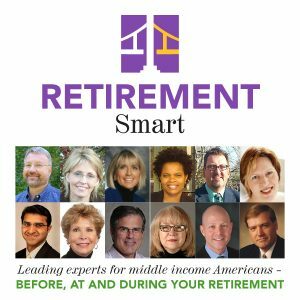 In addition to her duties as Chair of the Funding Longevity Task Force, Shelly leads the Home Equity Retirement Specialist program at Security 1 Lending and has developed a series of calculators to help planners assess housing suitability in retirement. In her career at Wells Fargo and MetLife, Shelley assumed many roles in sales and sales management but has been most steadfast in her commitment to education and ethical lending. She has pursued a long-standing interest in how to integrate housing wealth into the context of a holistic financial plan. In a 15 year career in HECM lending, Shelley has participated as a panelist in the White House Conference on Aging, and served as a speaker for the ABA, NAHB, CNN financial, and numerous other financial groups. How can I use a home equity reverse mortgage to help my retirement savings last? 1. How planning for possibly using housing wealth early in retirement can help retirement savings last. 3. How a reverse mortgage strategy can prevent selling the marital home and provide a means for equitable housing for both parties in case of divorce. Home equity is the largest asset middle market retirees have after the present value of their Social Security and pension benefits (working in retirement is 3rd; savings is 4th). In a time when lifetime income sources such as pensions and Social Security benefits are declining, accessing home equity will become more important as people live longer and face increasing health care costs. Reverse mortgages offer a mechanism for tapping home equity for retirees to address these needs and stay in their home. Because of key changes made to reverse mortgages by the Federal Housing Administration to the Home Equity Conversion Mortgage program, the safety and functionality of accessing home equity now goes beyond supplementing retirement income. 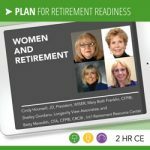 By being retirement smart, we can help our women clients prepare ahead of time for the retirement-specific risks that are most likely to affect them. In retirement, women are more at risk than men of living longer than expected, surviving a spouse, experiencing a “grey divorce”, being a caregiver, dealing with the long-term care expenses of a spouse, and eventually relying solely on Social Security for their retirement income. 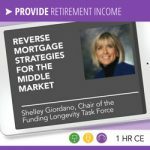 Shelley has spoken on reverse mortgage lending at retirement income planning conferences, and for organizations such as NRLMLA, ABA and NAHB. She speaks frequently on the radio and appeared live on CNNfinancial. She has been a regular participant at industry events and specializes in bringing together reverse mortgage lenders with other financial services experts. 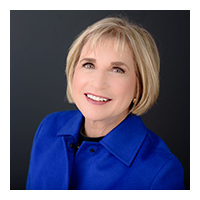 Shelley Giordano writes regularly for the industry and participates as a subject matter panelist for housing wealth in retirement. She is the author of the book “What’s the Deal with Reverse Mortgages?”, and co-author of “What You Don’t Know About Retirement Income Can Hurt You”. “With the advent of the HECM Saver, we now have a program that appeals to financial advisors. Lower cost, a non-cancellable line of credit, a line of credit that grows independent of home values, and no pre-payment penalty are all attributes financial advisors will appreciate. Never before has our industry had evidence that the HECM program could play such an important role in mainstream financial planning. But does this mean that we have to become financial planning experts in order to engage financial professionals? Not really. We are the experts in how to unleash home equity safely in retirement years and we don’t need to pose as experts beyond this. These new studies prove that we do have a powerful message to deliver to financial planners. It might even be argued that we have an obligation to get the conversation started on how home equity can be deployed to buffer the risk of depleting assets when they are undervalued, especially early in retirement. Shelley earned a B.A. from the College of William and Mary and an M.A. from Old Dominion University. How can you schedule Shelley Giordano to speak at your event? Shelley Giordano is an experienced speaker and presenter with a passion for providing industry-leading information to audiences. She is available to speak at your conference or appear at one of your events. Inquire here about having Shelley Giordano speak at your conference or event!